UFO Flight Characteristics ~ Right Angle Turns. "There are some definite flight type characteristics that are seen now that I would say represent genuine UFOs...ie: instant acceleration; instant stop; vertical acceleration -up into the air and down to the ground; reverses in direction; right angle turns - all in silence - multiple objects sometimes separating and then going back into each other. They are classic, what I would call, genuine UFO characteristics - things that we can not do in a conventional sense". As I'm sure a lot of people already know (including Gary Heseltine) there's been quite a number of reports over the years describing unidentified flying objects performing highly unusual flight characteristics like instant acceleration, immediate stops, reverses in direction, pendulum motion etc.. - below are some reports dealing with right angle turns, if anyone knows of any other examples then please feel free to post. Lt. Rogers followed the object in a diving turn to the left descending to an altitude of about 16,000 fet with the object about 8,000 feet below and to the right of the aircraft. Thereafter he tried to keep a course paralleling, but above, that of the object. 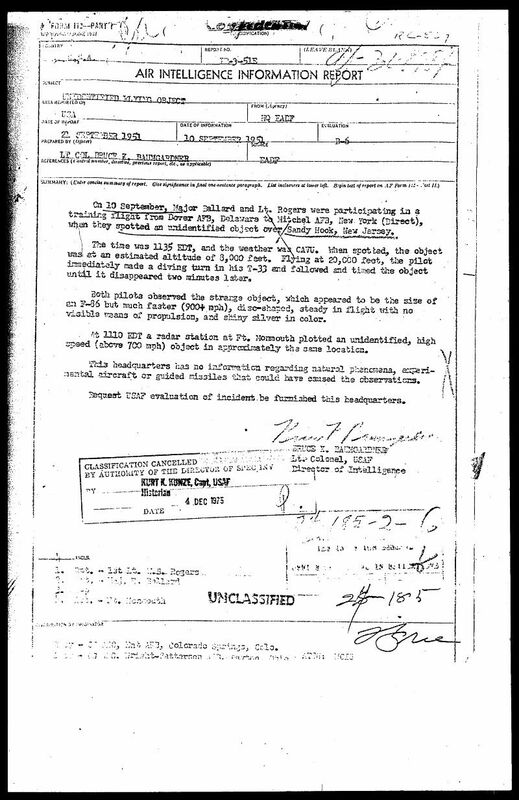 As soon as Major Ballard completed his radio report he was notified of the strange object. Both watched it make a 90 degree turn to the left and kept it under observation together while it covered approximately 20 miles before it disappeared out to sea. 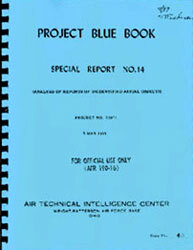 On the same date a radar station at Ft. Monmouth reported two targets that were unidentified, traveling over 700 mph, and giving returns that could not be explained as being equipment malfunction, anomalous propagation, or anything but an actual target as described in the attached report. Right Angle turns over Vietnam. 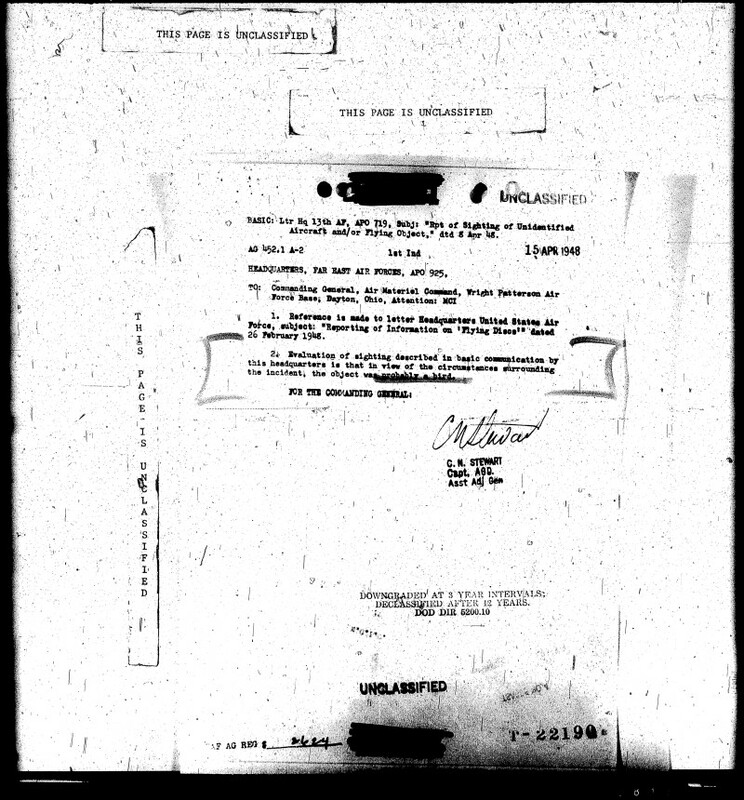 My friend John Miranda, who was the first to show me evidence for UFOs, heard first-hand an account from a co-worker in 1972: Andy (not his real name) had just served as an USAF Technical Sergeant in “what he described was the intelligence center in Thailand that coordinated the military aircraft flights over all of Vietnam. As he put it, ‘if there was a plane flying anywhere in S.E. Asia, this control center knew about it’.” It was probably the Nakhon Phanom Royal Thai Air Force Base, identified in FOIA documents discussed below. Andy reported that “one day [probably in 1969] on multiple radars, they tracked an object traveling at 7,000 mph that repeatedly made right angle turns. They checked with the top commanders from Air Force, Army, Navy and Marines. All confirmed they had no aircraft flying in that area at the time. Of course, the folks in the intelligence center were warned never to speak of this event.”Miranda added that Andy was a sharp individual without tendency to exaggerate. “He knew exactly what he was telling me. And he had no reason to embellish the story.” Thus ended my first Vietnam UFO story. More were to follow. 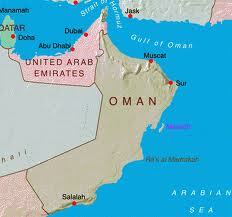 Objects make 90 degree turns ~ Gulf of Oman. In 1989 the aircraft carrier USS Midway was on a tour of duty in the Indian Ocean. On a mission in the Gulf of Oman, the Combat Direction Centre (CDC) watch officer and his crew were electronically monitoring the positions and movements of all surface contacts to ensure a safety margin of three miles or more from any potentialy hostile vessels. Suddenly the officer spotted three strong blips (contacts) on his radar screen grouped in triangular formation. On the second sweep of the radar screen the officer was stunned to see that the contacts had moved a considerable distance in a remarkably short period of time. 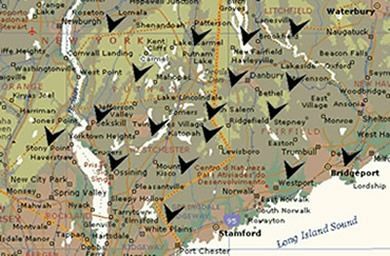 While this CDC group's mission is to monitor and track ocean surface contacts, low flying aircraft are also periodicaly picked up on their low angled radar. These contacts however, were moving faster than any aircraft the officer or his crew had ever observed. The next unnerving thought to occur to the CDC officer, was that these were missiles. The officer checked with the airbourne detection group within the CDC and they responded that they weren't picking up or tracking anything at all.There were no contact blips flashing on their screens. Tensions mounted quickly however,as the CDC officer and his crew continued to track the three fast moving blips as they angled towards the ship. As the "contacts" rapidly got closer, two of the blips made a startling ninety degree turn away from the ship ,but the third turned directly towards the ship. The CDC offcier excitedly barked over the ship's intercom to the observers on the ship's superstructure that something was coming right at them at a high rate os speed. Accelerating, it was coming in so fast there was no time to react. When the object got within one mile of the ship it suddenly disappeared from radar..
On June 20, 1968, about 2 a.m., Mr. & Mrs. Larry Ferney of Mobile, Alabama, were driving near Roswell, N.M. when they saw an object descending from a height of about 100 yards. The UFO displayed three bright lights, "like the landing lights of an aircraft." Making a 90-degree turn, the UFO headed down toward the car and proceeded to pace it for 5 miles at an estimated distance of about 50 feet. Mr. & Mrs. Ferney were in a state of near hysteria, first fearing an imminent crash, then frightened by the mysterious object apparently pursuing them. Finally, the UFO raced out of sight. Police Officer witnesses object making right angle turns ~ Manchester, 1976. Location – Bury, Greater Manchester. After completing his duty DETECTIVE SERGEANT NORMAN COLLINSON was driving home along the M62 and M66 motorways.As he turned north onto the M66 he observed a white disc of light moving very fast which crossed the path he was travelling. The object was heading toward Knoll Hill, east of Bury. The UFO made a right angle turn onto a south to south-east heading. The object was heading in the direction of Heywood. Puzzled the officer stopped his vehicle and got out to look at the light. As he did so the light stopped and hovered near to his location. It then began to perform a series of spectacular ‘box’ right angle turns. The UFO began to move off in the direction of Heywood once more with DS Collinson following it in his car. The object stopped a second time and again repeated the angular movements described earlier before streaking away at a tremendous speed out of view. The incident was reported to the MOD and Manchester Airport. Off Duty sighting. 1 Officer. Source – FSR Vol 23 No 2. "The light would throb with an increased intensity prior to each change of colour and hover in the sky for some time and then dart and cover large distances, doing a number of right-angled turns at high speed". "When you have the view of the airspace and the radar screen and you see the UFOs go around twenty or thirty miles a second – that is very real. They can turn suddenly almost 90 degrees in a second or half a second. The UFOs can go vertically straight up very quickly." Witnesses: three men on the arms range, plus one Lt. Colonel 4 miles away. Five flat-white discs about the diameter of a C-47's wingspan (95') flew fast, made a 90degrees turn in a formation of three in front and two behind, and darted around, for 15-30 seconds. Witness: missionary pilot Jay Cole, flying a Beech C-45 twin-engined utility plane. One light performed aerobatics for 15 minutes and then vanished. A second light appeared, heading toward them on a collision course, made a 90* turn and disappeared. Later, ground radar told them a target was following them. Sightings lasted 15 minutes. Witness: wife of USAF Capt. J. B. Neal. One elongated, fuselage-shaped object flew straight and level, made a right-angle turn and went out of sight at more than 300 m.p.h., all in 3-5 seconds. Witness: U.S. Weather Bureau observer Earl Oksendahl. Five oval-shaped objects, with lights all around them, flew in a V-formation for about 20 seconds. Each object seemed to be changing position vertically by climbing or diving as if to hold formation. Formation came from the northwest, made a 90* overhead, and flew away to the southwest. Witness: Lt. L. Brettner. One round, glowing object flew very fast, made right angle turns and reversed course during a 1 hour sighting. Witness: insurance company president William Washburn. Four large, elliptical-shaped objects were seen to fly very fast, stop, turn 90* and fly away in 7-8 seconds. Witnesses: two skilled Arsenal employees including Mr. Washburn. one object, shaped like a bowtie, and like polished aluminum. Flew straight and level, then one triangle rotated 1/4 turn in the opposite direction and returned to its original position. The object then made a right-angle turn and accelerated away after at least 30 seconds. Witnesses: retired Col. Robert McNab, and Mr. Hunter of the Federal Security Agency. One flat object, like a pinhead, made three 360* right turns in 9 seconds, made abrupt 90* turns to the right and left, stopped, accelerated to original speed and finally flew out of sight vertically after 60-75 seconds. Witnesses: three USAF.air policemen at Washington National Airport. Two bright lights were seen on three occasions to fly straight and level, make 90* turns and fade. Each sighting lasted about 45 seconds. Witnesses: Sheriff Grysen, wife and others. Large white light, with smaller red and green lights seen to the sides. Made almost instantaneous 90degrees turn to left, shot out over road and stopped, moving too fast to follow. Sighting lasted 1 hour, 11 minutes. Washington Radarscope - right angle turn, figure E.
Diagram of the UFOs tracked by Washington's National Airport radar scope on July 20, 1952. At A, 7 objects approach the Nation's capital from the south. At B, some are seen over the White House and Capitol. At C, they appear over Andrews Air Force Base. At D, one UFO tracks an airliner. At E, one is seen to make a sharp right-angular turn. 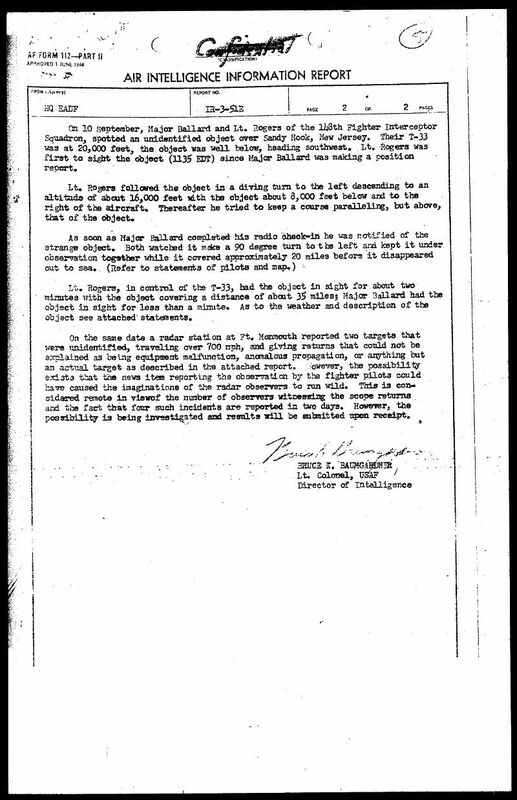 "There is no other conclusion I can reach but that for six hours on the morning of the 20th of July, 1952 there were at least ten unidentifiable objects moving above Washington....I can safely deduce that they performed gyrations which no known aircraft could perform. By this I mean that our scope showed that they could make right angle turrns and complete reversals of flight". Senior Air Route Traffic Controller Harry Barnes. "I saw several bright lights. I was at my maximum speed, but even the I had no closing speed...Later I chased a single bright light which I estimated about ten miles away. I lost visual contact with it at about two miles". Lt William Patterson, F-94 Pilot who chased UFOs over Washington DC, 1952. .."What happened next convinced me these were intelligently controlled vehicles. As they approached the starboard side of the ship, the object on the left turned to the West at a 45 degree angle and reduced speed. The right one continued flying south directly over the ship. After passing over the ship it made a sudden 90 degree turn to the West without loosing speed. Both objects were getting closer to each other again. The one on the left made another 45 degree angle turn to the West and they were again flying parallel heading west. This was a very slick and precise maneuver that seemed automated or programed. We continued to observe these objects until they disappeared in the Western horizon." 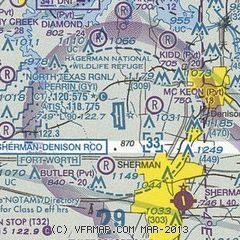 .."We watched as the fighters were heading to intercept; the UFO's had crossed the border of Oklahoma and entered Texas by this point.When the fighters got to about 20 miles of interception, the UFO's stopped dead in the air, made a right angle turn and took off towards the Northwest. We calculated their speed at about 8000 miles per hour. There were 8 officer Radar Operators and 3 Radar Techs in our Hut during this episode. 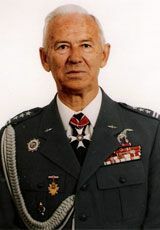 Within ten minutes after the final sighting a group of about 8 men in civilian suits, and 14 uniformed armed guards came into the Hut, separated us, and took us at gunpoint to a hangar on the other side of the field." UFO OUT AT SEA -- During a routine weather observation on October 2, 2007, at 10 PM. aboard a Naval vessel during flight operations, I witnessed an object to my east moving at an extreme speed and changing directions rapidly before disappearing. We were about 100 miles off the coast of southern Virginia.It was a white light about four times the size of a star. Imagine an airplane at night with it's lights not blinking, but flying about 5,000 mph. Moving at a 45 degree angle from east to west it abruptly changed course and made a right angle turn and disappeared. I am a Meteorologist for the Navy and observe the sky on a nightly basis. I have never seen anything like this. It was not caught on our radar. It appeared to be about 5-7 miles away, but I suspect it was much farther away than that. Newburyport, Massachusetts, United States, April 26, 1954. Summary: Russell M. Peirce, architect, reported a circular object which made a right-angle turn. "I was standing at the rear of the local High School building talking with two friends... Suddenly we all heard a very loud deep roar as of many motors... The object as I first saw it appeared as a flaming ring. The color was a little on the whitish tone but also had some suggestion of the orange-yellow of the common flame of burning wood, say." "We were out about six hundred miles over the Atlantic at 21,000 feet heading in to Logan.. Reflexively I swiveled my head to look at him and caught this dazzle of twinkling lights coming at us from the starboard side, just ahead, and appearing maybe about fifty feet below. Instantly Slim and I realized that whatever the thing was, it was moving in a hurry, that it was entirely too close, and appeared to be about to cross in front of, or about to collide with us. And it was huge! I slammed on some power, hauled the nose up and prayed we'd go over the top of that thing. Just as we started to climb, this thing swept straight up, did an impossible right angle turn and begins to pace us. I don't see how ANYTHING could have executed a maneuver like that -- I mean almost a simultaneous two-directional turn -- up and to the right, not to mention coming to damned near a dead stop!" I Too Saw a UFO! It happened back around 1970. I was travelling in the late afternoon, right around sunset, down Route 9 from Middletown, CT to Old Saybrook. As I was driving, I noticed a small shiny object up in the sky flying parallel to the ground at a very high rate of speed. The sun was glinting off of it, making it especially bright. It caught my attention because it was flying much faster than a commercial jet, and was leaving no contrail. There was no apparent shape to it. That is, I couldn't see wings or a tail, but it was pretty far off. I was just speculating as to whether it might be a supersonic military jet when suddenly the thing made an abrupt right angle turn, way beyond the capabilities of any airplane--and so fast that anyone sitting inside it would have been killed by the G-forces--and then shot straight up into the sky, much faster than before, and just disappeared. My father and I witnessed what at first appeared to be a star in the sky. Then it took off in a high rate of speed and I thought, a satellite. Then it performed a right angle turn, followed by another turn after 10 seconds. I yelled to my father to come out here, 'What is this???' He grabbed the binoculars and witnessed it change colors three times, white to red to blueish-green. It then performed more perfect right and left angle turns and went close from (horizon to horizon in seconds). After 2 minutes and lots of Jet aircraft coming in or flying around, it just kind of "Imploded" or winked out and was gone. And was then the discussion of hours of talk and apprehension. 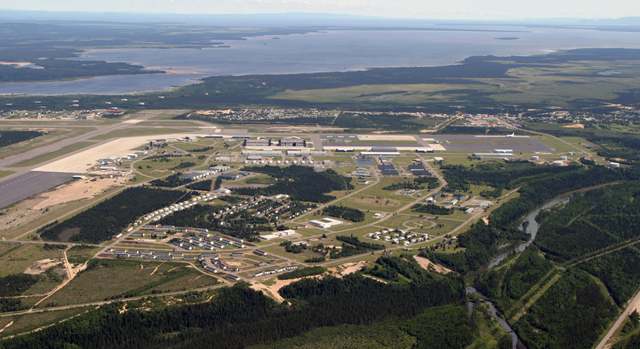 A fiery, spherical object made a right-angle turn during an observation by a C-54 crew flying from Westover to Goose Bay. It was also seen from the ground by the control tower and by two men who plunged to the earth when the object made a low pass at them. It went away at 2247. On March 25, at 7:55 p.m. (local time), a satellite-like object about the apparent size of the full moon was spotted by 6 workers from the Santa Maria farm, the place where I use to go at week-ends. 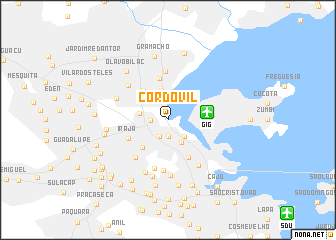 That farm is close to the town of Vassouras, about 80 miles away from Rio de Janeiro. When the object was first seen, it was coming from the south, from the direction of Rio. It was moving slowly with a kind of jerking motion, was round in shape and surrounded by a yellow glow. It was soundless when it came over the farm. It was moving along a linear trajectory but -- when over the farm -- it made a right-angle turn to the east and moved away with the same speed, disappearing into the horizon. The sighting lasted for about 20 minutes. At 08:40 p.m., Linda Nicoletti, a family mother in her thirties had looked out a window of her house in Brewster. She saw a large lighted object hovering over Interstate 84 just west of her home, and she first thought it could be a large jet airplane that was going to crash into her house, but realized it was not an airplane: it was moving too slow. 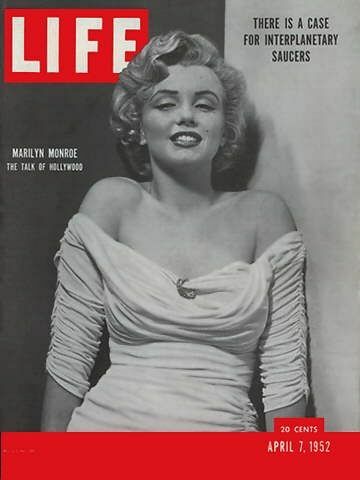 She described it to the investigating ufologists as V-shaped with rows of bright lights along its "wings." She said that there were so many of these lights that it impossible to count them, and that they were of all colors of the rainbow, with one much larger and brighter light in the center underneath. The object drifted slowly toward her house. She opened the window where she stood watching to check what the object sounded like, but she heard no sound, which confirmed to her that it could not be an airplane. Then the object then made a right-angle turn and headed toward the home of her neighbor Dennis Sant two doors away. When the object turned, she saw Dennis Sant standing in his garden also watching the object. UFO witnessed making right angle turns - Illinois, 1964. Lawrenceville, Illinois, June 8th, 1964. On June 8th at 9:30 PM in Lawrenceville, Illinois, which is just across the river from Vincennes, a CE1 sighting took place. The witness, Mrs. Helen Reed, described a close-up observation she had of a peculiar looking object which was in the vicinity of her barn and in the air not more than 10 or 15 feet high. It was a typical domed disc with a flat bottom. When she first observed it the dome was glowing a soft blue. The object then moved erratically away from the barn and the dome turned a bright red orange in color. It then executed several sharp right angle turns and disappeared behind her shed. On May 29, 1951 at 3:48 p.m., three technical writers for the aerophysics department of North American Aviation's plant at Downey, outside Los Angeles, were chatting on the factory grounds. They were Victor Black, Werner Eichler and Ed J. Sullivan. All at once they stared at the sky. 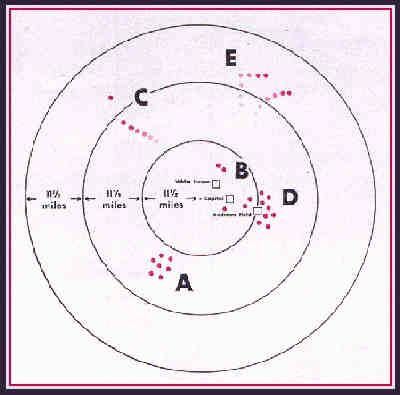 Sullivan describes what they saw:"Approximately 30 glowing, meteorlike objects sprayed out of the east at a point about 45 degrees above the horizon, executed a right-angle turn and swept across the sky in an undulating vertical formation ... that resembled a tuning fork on edge. It took each of them about 25 seconds to cross 9O degrees of the horizon before performing another right-angle turn westward toward downtown Los Angeles... We estimated their diameter at 30 feet and their speed to be 1,700 mph. Each appeared as an intense electric blue light, round and without length. They moved with the motion of flat stones skipping across a smooth pond." No known natural or optical phenomenon, makes the peculiar light, in bright day, attributed to these objects by Sullivan and his colleagues; nor can any natural object, hurtling at such a speed, execute a right angle turn. As in the Moore theodolite sighting, the execution of such a turn would have crushed any human crew under the impact of "G" forces. Finally, of course, no known machine travels at 1,700 mph without making a sound or leaving an exhaust or vapor trail. San Luis Reservoir UFO, Merced County, CA, April 8, 1981. 3:00 AM. 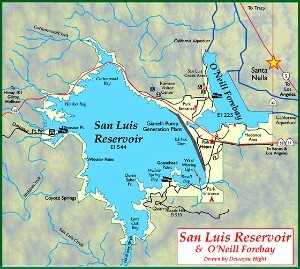 The complete failure of an aircraft's electronics, including the transponder, DME, navigation equipment, and two-way radios, occurred when a bullet-shaped UFO passed within 500 feet of an airplane being flown by Mr. Dennis, a flight instructor, while flying over San Luis Reservoir, Merced County, California at 3:00 a.m. The electronics recovered after the UFO had gone. The object was described as 35-50 in length, with a pulsating orange front end, and having a blue ring perpendicular to the craft. The object was said to be whirling, and made an instantaneous 90 degree turn. Sources: J. Allen Hynek, International UFO Reporter, January 1982, p. 6; UNICAT database, citing Tom Page, case 34; Dominique Weinstein, Aircraft UFO Encounters, p. 43. HOT SPRINGS -- I was at work pulling shopping carts inside on March 23, 2001, as my job requires, when an older gentleman said, "What the HELL!'" Concerned for customer safety, I looked around and saw the gentleman looking into the sky.I looked up also at 7:23 PM. About 500 feet in the air were eight crafts that appeared to be making high-speed ninety degree (90 degree) turns. The gentleman noticed me watching and asked me if I saw them too. I replied with a, "Yes sir!" and then proceeded to ask him, "What are they?'' He replied, "I don't know." We watched these acrobatic crafts for almost seven minutes before six of them shot off to the North at an astounding rate of speed. The other two craft just sat and hovered for a minute or so and then shot off the West just as fast as the six to the North did. I have seen aircraft like F-16's make turns but not as sharp or perfectly cornered as these craft seemed to be doing. While driving on highway 89 North in NH I witnessed a bright light appear in the top edge of my windshield. I leaned forward and looked up and observed a bright light meandering along under apparent intelligent control. I immediately recognized the light as some kind of propulsion. The craft was very low in the sky maybe one hundred yards or more up, it was just below the mountain line in the background. The flight pattern of the craft was a very slight and gradual weaving from left to right barely noticeable. Then, suddenly, it accellerated faster than any aircraft I have ever seen and I have seen the fastest aircraft in the world, the SR71, take off many times. Then, the most amazing thing of all happened, the craft, while accellerating, made an absolute ninety degree turn to the right(east), which confirmed my thought of the light being that of the propulsion system, the light was no longer visible because the craft had turned, and there was no light visibly emminating from the back after it turned, then it was gone in a split second as it accellerated even faster. I was able to see just a shadow of the craft against the moonlit sky as it dissapeared, and as fast as it took off it did appear to literally disappear. "During the 1955 Warsaw Pact exercises, a radar station in the area of Warsaw recognized two targets over the Gulf of Gdansk. The targets were moving at a speed of 2,300 km/h at an altitude of 20 thousand meters. In those days there was no aircraft with such performance.At one point it was noticed that the two objects did a 90 degrees turn, literally on the spot with no turning radius. This maneuver at such high speeds cannot be done. Most modern aircraft are unable to do so even today, and that was 50 years ago". 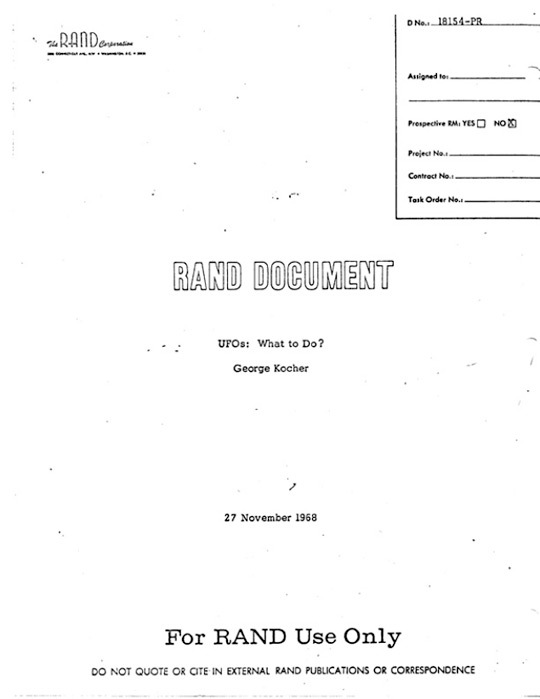 Report taken from The RAND Corporation Report - "UFOs: What to Do"
"'The UFO appeared to be about the size of one of the Cape Cod houses over which it passed, which would make it approximately 30 ft. in diameter and about the same dimension in height. It was circular, surmounted by a dome giving off flashes of green light. The center section rotated a series of square shaped "windows", each giving off a brilliant white light. The base section was somewhat saucer-shaped,curved upward. Shafts of white light were directed downward from the base.' Unfortunately, my wife cannot recall if the exterior was metallic in appearance. In any event, the object had a well-defined outline. Again, it moved silently. There was no evidence of occupants of the UFO..
An Illinois witness is reporting a triangle-shape UFO moving overhead at "Mach 1" suddenly turned north in a "perfect L" move and disappeared on March 14, according to testimony from the Mutual UFO Network (MUFON) database. "No aircraft moving at that speed can do that," the witness stated. The object was described as having steady amber lights at its outward edges and one flashing light. The witness said the object "visibly disappeared as if the lights on it were extinguished." Right angle turn report from Brazil, 1966. On March 17, at 7:46 p.m. (local time), a formation of four UFOs was sighted from the district of Vista Alegre in Cordovil, a suburb located in the north area of Rio de Janeiro..
Then all of them stopped suddenly in mid-air, for more than 10 seconds. Again they started to move at high speed and came together to fly in close formation. They emitted a bright white glow and looked like first-magnitude stars flying in formation. They maneuvered always at high speed, making right-angle turns and stopping in mid air for several times. At that moment Mr. Righy was already shouting for his neighbors to watch the phenomenon. In a few minutes a small crowd was gathered at the street - men, women and children. Pilots of a passenger jet witness UFO make a right angle turn, separate from another object then submerge into the sea. "We were out about six hundred miles over the Atlantic at 21,000 feet heading in to Logan..
"I slammed on some power, hauled the nose up and prayed we'd go over top of that thing. Just as we started to climb, this thing swept straight up, did an impossible right angle turn and begins to pace us. I don't see how ANYTHING could have executed a maneuver like that -- I mean almost a simultaneous two-directional turn -- up and to the right, not to mention coming to damned near a dead stop"
"We couldn't detect any sound, see any prop or jet wash, nor see any exhaust. It just kept flashing a lot of lights around the middle. Once we leveled off again, the thing stayed just ahead of us off to our right and we had a chance to observe it.We couldn't see any hard outline or shape to it but, you could tell it was circular because of the lights..
USA Loring AFB, Maine - an ANG helicopter pilot. "We're talking about reliable law enforcement officials who say that these things have gone directly over their cars, 50 to 100 feet away. When you don't hear something that does incredible maneuvers, makes 90 degree turns, starts and stops and accelerates at hundreds of miles an hour, then you have to start considering that maybe we are dealing with something that is not made on this earth". Another report from the Philippine Islands in 1948. "Saucer Eludes Army Pilot By 90-Degree Turn"
Manila -- Lt. Robert W. Meyers of the 67th Fighter Wing, 18th Fighter Group, Philippine Islands was leading a group of 4 F-47s when he saw an aerial object 3 miles away. He turned around to check on it and watched it make a 90-degree turn and disappear within 5 seconds. It was silver colored and left no exhaust trails. According to the USAF the object was 'probably a bird'.